Recommending that drivers give up their keys ranks among the most difficult tasks elders’ physicians face, but documentation and planning can make it less painful. “It’s time to retire from driving” is among the most devastating messages a physician can deliver to his or her patients, especially because it impacts one of the most fundamental rights of adulthood. The recommendation for elders to stop driving is not supported by extensive research and data. However, as the elder population increases, there are more patients whom family members or physicians believe are no longer physically and/or mentally able to drive. But for many elders, the car is their only means of transportation to and from the grocery store, the doctor’s office, or their grandchildren’s homes. In fact, many older adults shuttle friends who can no longer drive. Physicians should carefully and thoughtfully make the decision to recommend that an older patient stop driving and do so only if corrective interventions have failed. The decision should be based on as much data as possible and delivered skillfully and compassionately so as not to infantilize the elder. The purpose of this article is to equip physicians with information, resources, and techniques to help their older patients cope with retirement from driving. William was an 85-year-old retired police chief, much beloved in his city. He had osteoarthritis and mild hypertension. His medications included acetaminophen and amlodipine. His wife had died 10 years prior and he lived alone. He drove an old truck and had had two accidents within a year. A close friend took William to see a geriatrician because he feared that William was becoming senile and probably shouldn’t be driving. A comprehensive geriatric assessment showed moderate dementia, with a Mini-Mental State Examination score of 19 out of 30. An ophthalmologic examination showed cataracts with a visual acuity of 20/80. William admitted to some memory problems but rejected the diagnosis of dementia and did not want eye surgery. William’s friend reported him to the state as being unfit to drive. A physician’s statement indicated his diagnosis and the danger in allowing him to drive. William presented before a judge—an old friend—who assessed William to have capacity, and he retained the right to drive. Three months later, William went missing from his home. His car was later found in a ditch, and he had suffered a concussion and multiple soft-tissue injuries as well as multiple rib fractures. He died a week later of complications of rhabdomyolysis and respiratory failure. Numerous physiological changes occur with aging, making older patients more prone to driving accidents. It has been estimated that around 90% of the information required for driving is acquired visually.1 Some age-related changes in visual function that may impair driving performance include decreased static and dynamic visual acuity, decreased temporal field of vision, decreased resistance to glare, impaired contrast sensitivity, reduced low luminescence vision, increased light and dark adaptation time, and changes in accommodation, angular movement, depth perception, and color vision. These changes may be related to physiological changes or disease conditions, such as cataracts, glaucoma, diabetic retinopathy, macular degeneration, stroke, retinitis pigmentosa, and ptosis. Most eye examinations assess static visual acuity; however, it is the dynamic visual acuity that is more relevant, and it can be detected at an earlier age and declines faster. This is mainly attributed to the impairment of the vestibulo-ocular reflex system, which may occur as age advances. Similarly, vision changes under low luminescence, which usually start at age 65 (and even earlier in some people), may warrant a restriction on driving at night. Safe automobile operation requires individuals to enter the car safely, fasten the seat belt, and operate multiple vehicle controls. They also must turn to view traffic, requiring motor abilities such as muscle strength, endurance, flexibility (especially trunk and neck mobility), range of motion of the extremities, and proprioception. Impairment of these skills is directly related to driving performance and may result from age-related phenomena or diseases, such as arthritis. Reaction and motor response times are known to increase with age and also can be responsible for reduced driving performance. Age-related changes are both complex and variable across time and among individuals. It is appropriate to identify older adults whose abilities have been compromised rather than targeting the entire older population. Tests recommended to assess driving-related skills help identify impaired drivers. American Medical Association (AMA) policy recognizes that physicians have an obligation to determine impairment of patients’ driving ability that may make them a threat to themselves or others. Assessment of driving skills involves several steps. (The ADReS Score Sheet, for example, is helpful and can be found at www.nhtsa.gov/people/injury/olddrive/olderdriversbook/pages/ADReSscore.html.) The goal is to identify disorders or conditions that can be reversed or treated. A detailed history and physical examination plus an assessment of vision, cognition, and motor performance are indicated. The history should focus on medical conditions, polypharmacy, review of systems, and a patient’s or family member’s concern about impaired driving behaviors. Individuals believed to be at risk of impaired driving should have formal, more detailed vision and cognition evaluations. Vision testing: Visual acuity can be tested using the Snellen E chart, and the retina can be examined by indirect ophthalmoscopy and visual fields by confrontation. Other aspects of vision important for safe driving but not routinely tested are contrast sensitivity, accommodation and adaptation, angular movement, dynamic visual acuity, depth perception, and color vision. For the test, a patient is given a paper with numbers 1 to 13 and letters A through M arranged randomly. The patient is asked to link 1 with A, 2 with B, and so on until reaching the last number and letter combination. If the patient takes longer than three minutes to complete the test, intervention is required. This can include a review of causes (eg, dementia, medications) and/or referral to a driving rehabilitation specialist. Motor tests: The Rapid Walk Test is performed by having the patient walk along a 10-ft path marked on the floor with tape. (If the patient uses a cane or walker, this should be noted on the scoring sheet.) The test measures lower limb strength, endurance, range of motion, balance, and gross proprioception. Bilateral joint strength and range of motion also should be tested. Depending on the results, appropriate interventions can be made, such as the correction of any visual deficits when possible, stopping medications, and recommending physical and/or occupational therapy. When the deficit is not resolved, the patient should be referred to a driver rehabilitation specialist, if such a service is available. These professionals can help to assess and, in some cases, suggest alternate arrangements that can be made to a vehicle so that driving is still possible and safe. Also consider recommendations such as restricting driving to daylight hours, with driving retirement considered as a last resort. Most states require vision testing during each renewal or at least during each in-person renewal, regardless of age. Eight states (Iowa, Kentucky, Mississippi, New Jersey, Oklahoma, Tennessee, Vermont, and West Virginia) do not require vision testing during renewal, and five states (Maine, Oregon, Pennsylvania, South Carolina, and Utah) require vision testing only after a certain age. In addition to a vision test, Washington, DC, requires a reaction test or physician certification of fitness when a patient reaches the age of 70, and Illinois requires a road test for renewal after the age of 75. Accelerated renewal cycles for older drivers exist in 18 states and Washington, DC, but only Tennessee issues to people aged 65 and older licenses that do not expire. In total, 19 states impose special renewal provisions, such as no mail renewal, a vision exam, road testing, certification from a physician of driving fitness, or a combination of these, based solely on age. Mandatory reporting of certain medical conditions, such as epilepsy and dementia, that may result in unsafe driving is required in California, Delaware, Georgia, Maine, Nevada, New Jersey, Oregon, and Pennsylvania. Other states encourage physicians to report at-risk drivers whenever necessary and justified after thorough assessment and evaluation in order to protect the patient and/or the public. It is important for physicians to be aware of their respective state laws in order to determine when to report an unsafe elderly driver without being liable for breach of confidentiality. Driving retirement should be considered as a last resort when the interventions for potentially reversible disorders have failed. Many elders voluntarily stop driving when they notice decline in reaction time or visual acuity. Many will stop driving based on recommendations from family members or physicians. However, some patients decline to stop driving despite recommendations. Some of these patients have mental capacity and simply don’t believe that a problem exists, and others have dementia and lack the mental capacity and judgment necessary to understand the issues. Helping elders with mental capacity: Some elders don’t recognize when they can’t drive, failing to detect any changes in their driving abilities. Subsequently, the recommendation to retire from driving may feel subjective to them. In these cases, it may be helpful to review with patients the data, including test findings indicating that they should retire from driving. A physician can help to interpret the findings of any testing. Discussing the possibility that a child, another adult, or even the individual or his family members may be injured as a result of continued driving may carry great weight. Outlining the liability that could be incurred often resonates with patients too. Since some elders with capacity are concerned about the subjective evaluation of decline in driving skill, they may consent to standardized tests. They can voluntarily undergo retesting by the Department of Public Safety, a test that varies among states and examiners. There also are for-profit companies that perform driving evaluations. A physician can strike an agreement with these patients to undergo the test and abide by the findings. Helping elders without mental capacity: Having a discussion about driving retirement can be especially difficult with this patient population. It often follows a session where dementia or other cognitive decline has been diagnosed. However, depending on the level of driving risk, this message often is better delivered at a subsequent meeting. Many elders with dementing illness simply will not recognize that they can no longer drive safely. The same techniques employed in patients with capacity should be used in those who lack capacity. The difference is that the liability is markedly increased if dementia and/or the recommendation not to drive are documented in the medical record. A physician can make recommendations but has no legal authority to stop someone from driving. This responsibility often falls to family members. A spouse or partner usually can drive the patient, provided he or she is not also impaired. Adult children often have difficulty discussing this issue with their parents. Most are raised to respect their elders, and taking away driving privileges is a role reversal that can be uncomfortable for both parties. Physicians can ease this burden by making the medical recommendation not to drive; however, family members are left to enforce the restrictions. In some circumstances in which the danger to the patient and others was overwhelming, families have sold, moved, or disabled the vehicle. If a substantial threat to public safety exists, after discussion with the patient and family members, the physician may be compelled to contact the Department of Motor Vehicles. In any situation, the physician must not infantilize the elder patient. The recommendation to stop driving should be conveyed as a gradual process involving the patient, family members, and perhaps a social worker. The physician must demonstrate compassion, empathy, and respect for each patient’s dignity. Fortunately, there are numerous excellent resources for patients and their families (see sidebar below). Many populous cities have well-developed transportation systems for people who are able-bodied or disabled . However, more suburban or rural settings may lack accessible transit systems. Fortunately more agencies are recognizing the increasing number of elders who need transportation assistance and are offering these services. For example, the Independent Transportation Network, a public-private network active in 22 states, offers low-cost transportation through unique business innovations. Additionally, the AMA has developed the Physician’s Guide to Assessing and Counseling Older Drivers, which is available for download or on CD-ROM. This guide includes resources for both physicians and their patients. — Carmel Bitondo Dyer, MD, is chief of staff at Harris Health Lyndon B. Johnson Hospital and associate dean of Harris Health System programs. She also is director of the geriatric and palliative medicine division and a professor of internal medicine at The University of Texas Medical School at Houston (UTHealth). — Padmahasta Pilla, MD, is an observing physician at UTHealth. — Faith Atai, MD, is an assistant professor of medicine and director of the UT Physicians Geriatric Clinic at UTHealth. AARP 55 Alive: This program offers classroom driver refresher courses specially designed for motorists aged 50 and older. American Medical Association (www.ama-assn.org): The organization offers materials on driver safety and a helpful list of links. American Medical Rehabilitation Providers Association (www.amrpa.org): Occupational therapists in your area can often assist or direct you to someone who can help older motorists. Association of American Medical Colleges (www.aamc.org): The organization has occupational therapy departments that may have programs in place to help older motorists. Eldercare Locator (www.eldercare.gov): This is a nationwide service that helps older adults and their caregivers find local services for seniors. Hills BL. Vision, visibility, and perception in driving. Perception. 1980;9(2):183-216. Medical conditions that may affect driving. In: Carr DB, ed. 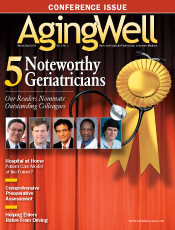 Physician’s Guide to Assessing and Counseling Older Drivers. 2nd ed. Chicago, IL: American Medical Association; 2010. Dobbs BM. Medical Conditions and Driving: a Review of the Scientific Literature (1960-2000). Washington, DC: National Highway Traffic Safety Administration; 2005. NHTSA Publication DOT HS 809 690. Staplin L, Gish KW, Wagner EK. MaryPODS revisited: updated crash analysis and implications for screening program implementation. J Safety Res. 2003;34(4):389–397. Freund B, Gravenstein S, Ferris R, Burke BL, Shaheen E. Drawing clocks and driving cars. J Gen Intern Med. 2005;20(3):240-244. Older drivers: licensing renewal provisions. Insurance Institute for Highway Safety website. www.iihs.org/laws/olderdrivers.aspx. February 2013.